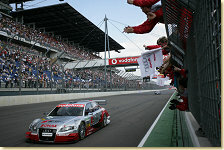 In front of an impressive backdrop of 78,000 spectators, Tom Kristensen claimed the first podium position for the new Audi A4 DTM at EuroSpeedway Lausitz. Following a Qualifying session that had not produced optimum results for Audi, the Dane � having started from seventh place � fought his way up to finish the race in second place. In the final phase of the race he managed to hold his ground against the pressure exerted by double Formula 1 World Champion Mika Häkkinen. With a fourth-place finish, Mattias Ekström clinched five valuable Championship points despite the fact that the front of his A4 had suffered severe damage in a collision. In addition, a drive-through penalty had been imposed on the Swede. DTM newcomer Pierre Kaffer served as a rear guard for the current Champion in the final phase, after having advanced from 19th to fifth place in spectacular fashion. 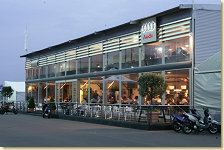 The Audi driver was thus the best competitor at the wheel of a car from last year. 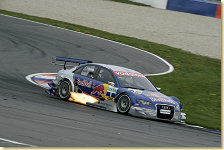 Frank Stippler, as well, claimed his first DTM points with a sixth-place finish, thus completing the strong result of the Audi squad. Christian Abt � finishing ninth � barely missed scoring a point. Rinaldo Capello finished in eleventh place, Martin Tomczyk in twelfth despite a puntured tyre. Allan McNish retired after a collision.